Pickering Creek Audubon Center announced that 10-acres of land was recently added to the 400-acre footprint of the Center, thanks to a gift of property from George and Catherine (Cemmy) Peterson. Cemmy and George have spent the last 20 years enjoying Pickering Creek through many seasons, hearing children squealing with delight across the creek as they experience the wonders of nature, which was one of the leading inspirations to donate their property. Both nature enthusiasts, Cemmy serves as a Trustee and past president of the Pickering Creek Board of Trustees and George is an active volunteer at the Center. 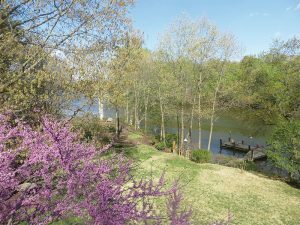 Blooming Redbud overlooks the creek at Peterson Woods. Through 2013, the Center board and staff worked on creating a Master Site Plan that both addressed infrastructure needs at the center as well as improving bird habitat in the larger landscape of the Center’s neighborhood. With forests as a high priority habitat for bird conservation for Audubon, a portion of the Master Site Plan for Pickering Creek seeks to knit together the forested parts of northern Talbot County to improve the area for forest interior dwelling birds. 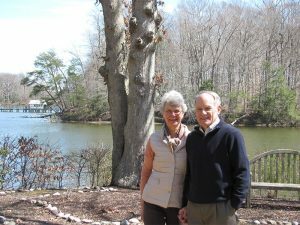 George and Cemmy Peterson donated their 10-acre property to the Chesapeake Audubon Society and will be known as Peterson Woods at Pickering Creek Audubon Center. In addition to broader conservation goals, the Center also sought to find additional places it could use to explore nature with its students, both young and old. The Petersons heard that call, and were a terrific part of creating that vision four years ago. In what can only be described as an awesome selfless act, they took the lead this past December by donating their 10-acre property and three bedroom home immediately across Pickering Creek from the main campus of the Center to the Chesapeake Audubon Society. “We are honored and awed to receive such a thoughtful and generous gift,” said Mark Scallion, Pickering Creek Audubon Center’s Director. The parcel, which will debut its first program with youth this month, will be known as Peterson Woods at Pickering Creek Audubon Center. 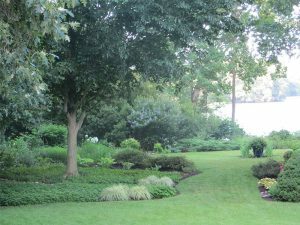 The Peterson gardens overlooking Pickering Creek. George Peterson reflects, “We always felt that the Audubon Center shared Pickering Creek with us. We were only a hundred yards away, across an arm of Pickering Creek, and shared everything from wildlife to the excited shouts of summer campers on Pickering’s trails and the equally loud shouts of our grandchildren (who went on to become Pickering campers). Our pileated woodpecker flew back and forth between the woods. For a time we had a river otter in our bank who made the same trip. In winters when the creek froze over, even the red foxes would walk back and forth across the snow. What a great gift to the wildlife and natural world of Talbot County. Whenever I am on the Eastern Shore I make an effort to visit Pickering Creek. Thank-you Mr. and Mrs. Peterson. Glad the world consists of people like you!